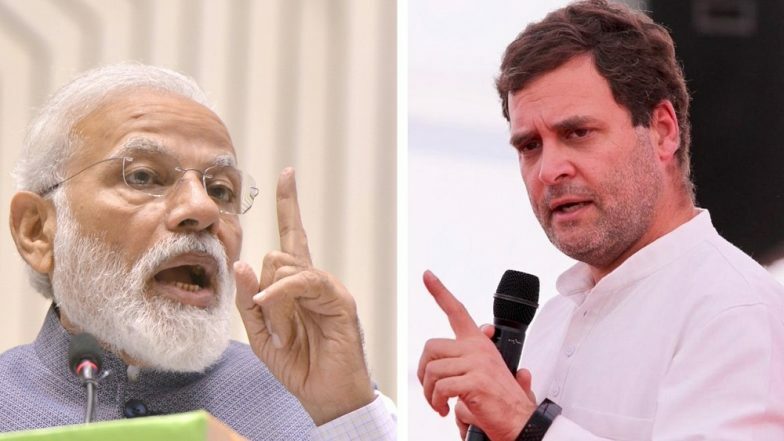 Bengaluru, April 12: Prime Minister Narendra Modi and Congress President Rahul Gandhi will campaign in Karnataka on Saturday for their candidates contesting in the Lok Sabha elections. "Modi will return to Karnataka to address BJP rallies in Mangaluru and Bengaluru," Bharatiya Janata Party spokesman S. Shanataram told IANS here. Gandhi will address three rallies in Kolar, Chitradurga and K.R. Nagar in the Mandya parliamentary constituency, about 100 km southwest of Bengaluru. "He will campaign for our candidates at Kolar and Chitradurga and for our Janata Dal-Secular (JD-S) ally candidate Nikhil Kumaraswamy in the Mandya seat," Congress official Prakash Rathod said. Modi addressed two rallies at Chitradurga and Mysuru on Wednesday. Of the 28 seats across the state, 14 in the central and southern regions will vote on April 18 and the remaining 14 in the coastal and northern regions on April 23. Vote count in all the seats is on May 23. Rahul Gandhi Mocks Narendra Modi’s ‘Make in India’, Says Markets Flooded With ‘Made in China’ Products. Of the seven rallies the BJP has scheduled for Modi, the last two will be at Belgaum and Chikkodi. The BJP is contesting in 27 parliamentary seats and supporting multi-lingual south India actor Sumalatha Ambareesh, an Independent, from Mandya against Nikhil Gowda of the JD-S. The Congress and JD-S have fielded joint candidates in all the 28 seats in the ratio of 21:7 under a seat-sharing arrangement. As Modi's two rallies in the state coincide with the first phase of polling on April 18, BJP's rivals protested that his address at the twin rallies if held during the day may influence the electorate voting in 14 seats across the central and southern regions. Gandhi has already campaigned for the party in the state twice on March 31 at Kalaburagi and Bengaluru on March 18. He also addressed a party meeting at Haveri on March 9.